A few months ago we wrote about My Favo(u)rite Magazine, a project in support of creative director Bob Newman. Since then the newsprint publication has been read all around the world, from Tokyo to Ipanema Beach. The process of taking and collecting snapshots has been amazing. It started with the illustrator Brook Meinhardt, who lives on Orcas Island in Puget Sound between Seattle and Vancouver. She posted hers on my Facebook page, and it took off from there. We’ve gotten them from babies, 90-year-old friends of my mom’s, dogs and cats, and everyone in-between. And there are people like the illustrator and art director Neil Gower who took his copy all over London, photographing it in the British Museum and in various offices and studios. Obviously the My Favo(u)rite Magazine project is important to me personally because it’s raising a significant amount of medical and living expenses funding for myself and my family. Of course I’m very grateful for that. But in addition, the process of collecting the photographs and promoting the project has been great therapy for me. It helped me get back into online posting and communicating, something that my doctors kept stressing was essential to my recovery...I hope that we can continue to get and share pictures from My Favo(u)rite Magazine, and again I want to thank everyone involved for making such a significant contribution to my recovery. We've loved seeing all the support for this project and finally got around to taking our own photo for Bob's collection. Hullo from the Glasgow office! 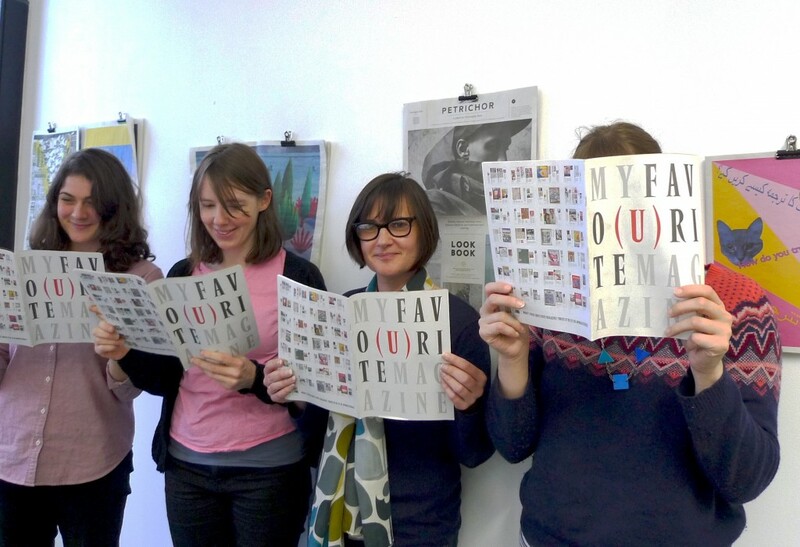 Copies of My Favo(u)rite Magazine are available from the Magculture shop. And you can keep up with Bob and his ongoing recovery on his Twitter and Facebook page.